Welcome to 'One York House' our little haven nestled within the heart of beautiful Llandudno at the foot of the Great Orme. Relax and unwind in our stunning, luxury accommodation, which boast every convenience you could wish for in your holiday accommodation. Our 1 bedroom the apartment is extremely spacious and is equally suitable for both a couple or a family of 4. The large family sized bedroom has a beautiful vintage double bed and 'Laura Ashley Style' Day bed that converts into 2 single beds. Put your fit up and relax on a huge L-Shaped Sofa and watch a movie. The Sofa converts into a double bed for kids who prefer to sleep in a separate room to mum and dad. All rooms are stylish and spacious. The apartment has both a modern kitchen with a large fridge freezer, dishwasher, oven, hob, microwave and all the cooking utensils you would have at home. A separate Washing machine and Tumble Dryer are provided. Our fantastic bathroom contains both a bath and separate large shower cubicle, depending on whether you want to get ready for the day or unwind in an evening. The lounge has a full dining table and chairs for your evening meal, or if the evening is nice, you can dine outside on the patio area. In the day the patio provides a little 'Sun trap' area too. A parasol and sun lounger are provided. Naturally all Bed Linen and towels are provided. Free Roadside Parking is directly outside the property. Once arrived why not leave the car behind and take your time to explore the unspoilt Victorian charm of this North Wales gem. Take a 5 minute stroll down to the prom and the pier or alternatively head in the other direction to the West Shore beach to take in the breathtaking views of the mountains of Snowdonia. Then head back for a glass of wine and some alfresco dining on our sheltered, south facing patio. Hi we are Michael and Katharine, your typical busy working parents with two beautiful and active children. We love owning a property within easy reach of where we live, that we can visit throughout the year and really spend some quality family time together down in charming Llandudno and the beautiful North Wales countryside. We spent our family holiday in 2011 staying at a friends apartment in Llandudno. Immediately we fell in love with town. It's well maintained Victorian Character is very appealing. The West Shore Beach is breathtaking at Sunset. We also adore exploring the Great Orme. There is an abundance of choice of nice restaurants too. During that holiday we came across this apartment and instantly knew it was the property for us. It is 1 of 7 luxury apartments in a 4 storey Victorian property that has been fully renovated and modernised in 2011. Llandudno is the perfect location for short breaks for us and needless to say we feel very lucky to own such a beautiful holiday home. We hope you enjoy your stay at 'One York House' as much as we do. Gorgeous bathroom, which is a match for many 5 star hotels! Beautifully Tiled and finished with high quality fittings. Seperate Bath and Double Shower Cubicle with Waterfall shower head. A huge L-shape sofa with a metal action 'fold out' Sofabed. Sleeps 2. Dining table and 4 Chairs. Flat Screen TV with Freesat Box, DVD Player and Ipod dock. Beautifully decorated room. Chest of Drawers Storage. DVD's & Board games. Beautiful modern fitted Kitchen with Oak Worktops and Integrated Appliances (dishwasher, oven, hob, fridge and freezer) All the conveniences you would expect in your own home are provided. Large South facing Patio at the front of the apartment with outside Dining Table, 4 Chairs and Large Parasol. Also there is an Outside Bench for relaxing and soaking up the sunshine. Llandudno has a dry ski slope and tobogan centre. An excellent property - warm, spacious but cosy & very well placed. 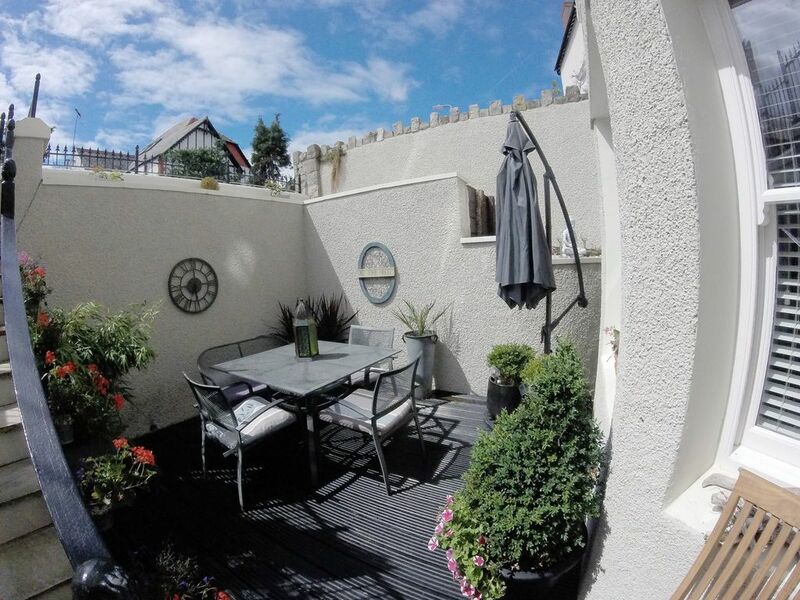 This property really helped to make our stay in Llandudno very enjoyable. It was very well decorated & furnished & very very clean. It was well equipped but I have to admit that we would have liked a tea-pot & milk jug (and a better dish cloth). Everything else - superb! Llandudno is a lovely place for a holiday & I hope we will return. I would certainly recommend this property. We loved it from the time we walked in it was like home from home, brilliant communication from the owner Michael Swift. Everything you need is there, we really didn't need the car and didn't use it very much. We loved it so much we want to go back in the summer to use the outside space. Thank you so very much for allowing us to use your holiday home, we will be back. Julie West Midlands. This is a very comfortable property! Although it was just my husband and me we really appreciated the roominess of the apartment. We had plenty of room for our things and to relax when we were not out exploring. The kitchen has a washer AND A DRYER! We loved that and made good use of it. The property was very clean and outfitted with everything we needed. The location was ideal-we we were able to leave the car parked and walk everywhere including to the summit of The Great Orme. Highly recommend this property! Beautiful apartment and good location. Lovely place with outdoor patio. Would definitely recommend. My second stay at One York House was just as perfect as my first one. The apartment is simply wonderful, very tastefully decorated with everything you need. The location is perfect too, both promenades are equally easy to reach. I will most certainly come again! Thank you Bärbel for choosing to stay at One York House again. Looking forward to welcoming you back in 2019! We had never been to North Wales and didn’t have a clue but we were so taken by the photos of the property and the real thing didn’t disappoint! It was lovely inside and out and was finished to a very high spec. The shower was perfect. It was also in a great location to explore Llandudno and the surrounding area with lots to do on your doorstep. Thank You Jill, we are thrilled that we in some way, helped your first visit to North Wales to be a special one. We hope it won't be your last too. Kite Surfing is popular on the West Shore Beach. Llandudno is a popular base for walkers to explore the Snowdonia Ranges. The Marin Trail and Penmachno Mountain Bike trails are a short drive from Llandudno too. The apartment is within walking distance is Llandudno's Dry Ski Slope and Tabogan. Only 5mins walk to the main Llandudno beach with its Victorian Prom and Pier. The stunning West Shore Beach is only a 10minute walk down Abbey Road. The ferry port at Holyhead is only a 43 mile drive. The walled market town of Conwy is only 4 miles away. The picturesque village of Betws-Y-Coed at the foot of the Welsh Mountains is only 20 miles away. The island of Anglesey 22 miles away. The city of Chester is within easy reach for a shopping trip or to visit chester zoo for the day. Sorry no adult-only group bookings. Families or couples only. Thank you. Price for 2 people assumes bed linen for 1 Double Bed only. Price for 3 people assumes bed linen for 1 Double Bed and 1 Single. Price for 4 People assumes bed linen for 1 Double Bed and 2 Singles. Sofabed option can be requested instead of single beds No Pets. Holiday lets only. Maximum of 14 days rental only.